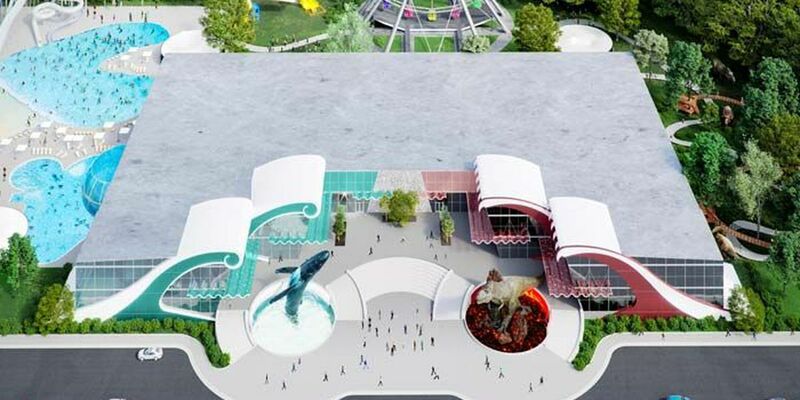 The aquarium would include a water park, an amusement park and a dinosaur museum. LOUISVILLE, KY (WAVE) - Ed Dana looks at sketches of his planned aquarium and dinosaur park every day. He admits the $80 million project is ambitious. "I've been thinking about this for years and years," Dana said. "I believe there's a major need for an aquarium or a major attraction." Dana leads Sleep Center of Kentuckiana and Okolona Motors. He said multiple investors and at least six banks have shown interest in the project. "I think that's plenty knowing that we've already secured half of the funds," he said. Architecture firm Luckett & Farley shared renderings with WAVE 3 News this week. The plan calls for a two-story attraction at Louisville's Champions Park called "Worlds of Fun." The park will be about the size of the Newport Aquarium at 100,000 square feet and also include an outdoor waterpark and dinosaur jungle. "We are planning on incorporating like exotic ideas to attract more visitors," Dana said. That includes a pool with glass walls, giving the appearance of visitors being able to swim with sharks. He's also planning a massive collection of animatronic dinosaurs. The biggest obstacle is where to put it all. "I would love to see it here in Louisville," Dana said. "If I can't, then, like I said, we're going to go forward with our plans." He said he's in talks with an area 'about 30 minutes' outside of Louisville. Dana has created a website called KentuckyOceans.com. "If you don't have the mayor's support personally, it's very challenging," Dana said. "It is frustrating a little bit, but we're going to keep moving forward." In a short statement, the city said, "Louisville Forward staff has had a preliminary discussion with a representative of the project. We discussed various sites of interest and await further information from the development team." Dana plans to break ground by the end of the year if everything stays on schedule and open up by 2021 or early 2022. "I think we went so far into this to back out now," Dana said.